The 2017 Easton MAKO Beast Baseball Bat could be the newest, most popular, bestselling baseball bat of the year. Easton continues to create more groundbreaking and more advanced sporting equipment every year. You would be hard-pressed to go to your next baseball practice or baseball game and not spot Easton equipment brought by your team members and your opposing team. You will most likely spot a lot of their bags as well. I am not a baseball player, but I knew the company name and have spotted the Easton bags and baseball bats at my husband’s weekly games. He is on two different teams and both I have noticed this brand at a lot. With him playing on two different teams on separate nights, he is always looking for the newest and most technologically advanced baseball bats he can find. If you are new to baseball or are looking for a bat for someone you know, let me give you a short background into the company. After all, knowledge is power and the more you know will give you a better chance of knowing you made the right call when you do decide on which baseball bat to purchase. Where to buy the MAKO Beast? Now that the Easton MAKO Beast is off of minimum pricing standards I think the best deals you an find are on eBay. At the time of this writing I found a few for very good deals. If you are willing to buy used then you’ll be able to save a grundle. Easton has been a leader in the baseball and softball industry for over thirty years. The company has continually raised the bar for their innovating and original products. Easton manufactured the first aluminum bat in 1969 and has been manufacturing new advancements in bats year after year. They have under their belt, the first aluminum bat, the first titanium bat, and the first carbon core bat; among many others. They continue amazing the baseball world with the most innovating and technological manufacturing, such as with the Tri-Shell ConneXion. The Tri-Shell ConneXion merged their groundbreaking advancements of two bats into one amazing baseball bat. Baseball bats are just the beginning of this company and manufactures a wide array of high-performance sports equipment. They deal in equipment for fast-pitch or slow-pitch softball, as well as youth and adult baseball. The company has the vast knowledge of those who have played sports by having athletes as their engineers. The 2017 Easton MAKO Beast is the most popular and newest baseball bat on the market (click here to see Best BBCOR Bats of 2017). It comes equipped with a composite barrel that is the largest and most powerful that the company has ever manufactured. By combining baseball’s longest two-piece barrel and extending it; it gives the 2017 Easton MAKO Beast baseball’s quickest swing speed. This baseball bat definitely lives up to its name as a beast. It also gives the advantage of the lowest index swing weight out of all the Easton 2017 manufactured baseball bats. What does a low index swing weight mean? Well a low index swing weight means you get a balanced even baseball bat that gives you all the power you require for fast-pitch swing speeds. The company completely remodeled their TCT, which stands for, Thermo Composite Technology. What this does is makes a barrel that is 1.5 inches longer than the first generation, popular MAKO baseball bat. The MAKO bats have always offered more coverage over the plate and gives you a much larger sweet spot. The barrel is extended and connects to a 31 or 32 inch composite handle by using their two-piece ConneXion technology, which is patented. This assists in maximizing the transfer of energy while at the same time helping to eliminate sting for perfect feel and innovative comfort. Another addition to add to the comfort of the sport is the impressive Hyperskin grip that comes with an unconditional manufacture’s warranty that is in effect for twelve months from the date of purchase. The 2017 Easton MAKO Beast (BBCOR) Baseball Bat is equipped with a -3 length to weight ratio, a barrel diameter of 2 5/8”, and it is also BBCOR certified for the both, high-school as well as college game play. You can find your 2017 Easton MAKO Beast Baseball Bat online at Easton Company, Amazon, performing a Google search. You may also be able to find this Beast of a baseball bat at your local sporting goods store; as long as they cater to a lot of baseball equipment along with high-performance, high-quality products. What Is The Main Difference Between The 2016 MAKO XL And The 2017 MAKO Beast Baseball Bats? The 2016 Easton MAKO XL and the 2017 Easton MAKO Beast are both BBCOR baseball bats. Both models are manufactured out of the exact same materials. The main difference between the two baseball bats would be that the 2016 Easton MAKO XL was equipped with an end-load feel swing, whereas the 2017 Easton MAKO Beast will come equipped with more of a balance feel swing. What Exactly Makes The 2017 Easton MAKO Beast So Much Better Than Other Baseball Bats Available On The Market? 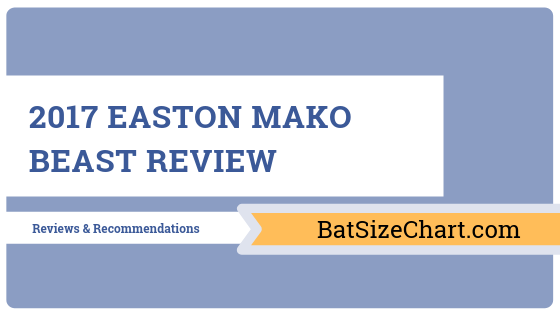 ​As I mentioned at the beginning of this 2017 Easton MAKO Beast Review, Easton has went above and beyond to create high-performance baseball equipment for a long time. So why put the money out for the 2017 Easton MAKO Beast? There are many features that this baseball bat has that makes it worth the money if you are seriously into your baseball games. Powerful: Baseball players who take their games very serious and see it as a huge competition will always want the best equipment available. “The Beast” is created to give a larger powerful edge than in the previous years. The new Thermo Composite Barrel, also known as, TCT, has been put in to give added power for speed and extra potential for an enhanced swing spot. Design In Two-Pieces: Since “The Beast” is a two-piece bat, it allows more flexibility than a one-piece bat. As for dealing with younger players, this can be an important benefit to them as it helps to speed up their swing time and helps keep them on the right track and not slow them down with a heavier bat and end up with a terrible hitting technique. Would I Suggest The 2017 Easton MAKO Beast For Use In Your Games And Practice? I would say definitely yes, I would suggest this bat, especially for a youth baseball player. The Easton MAKO baseball bats are even in the “2017 top youth choices” for the 2017 season. With the power generating, fast-swing speed, I believe you will see an improvement in the performance on the field very quickly. You should see stats raise and an overall greater performance that everyone will be quick to notice. Louisville Slugger is one of the most recognizable names in the world of high quality baseball bats. Of all the brand’s developments, the 917 Prime range is its top performer. The 2017 Louisville Slugger 917 Prime BBCOR bat is not an exception. Several characteristics determine the stellar performance of this bat and justify its relatively high price tag. Let’s take a look at these features together (click here to see Best BBCOR Bats of 2017). Where to buy the Slugger 917 Prime? Best place to find good pricing on the 917 Prime, now that it is off of MAP, is on eBay. When I looked while writing this post, there were a few fantastic deals for new in wrapper bats. Always be mindful if the bats come with real receipts. Louisville Slugger’s new Prime BBCOR bat is very different from everything else you’ll find on the market. Rather than being a one or two-piece bat, this one is a three-piece BBCOR-certified baseball item. There are several improvements and changes that make the bat different from the 916 Prime. The bat has a bigger, extended barrel that doesn’t interfere with the lightness of the swing. According to the manufacturer, this characteristic makes the bat equally suitable for the needs of power and contact hitters. The composite bat features Louisville Slugger’s MicroForm material that is patented due to the fused carbon structure that it features. The aim of the structure is to increase the pop and to maximize the sweet spot of the bad. Lightweight and balanced: regardless of the fact that it has an entirely composite construction, the bat is lightweight and balanced for optimal performance. Lots of pop: it seems that Louisville Slugger’s fused carbon structure is serving the purpose that it’s been chosen for. 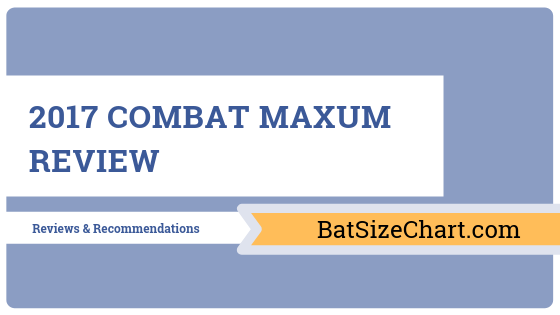 Most customer reviews point out the excellent pop that the bat is capable of producing. Speed enhancement: light and balanced, the bat enhances significantly the speed of the swing and contributes to technique improvements. 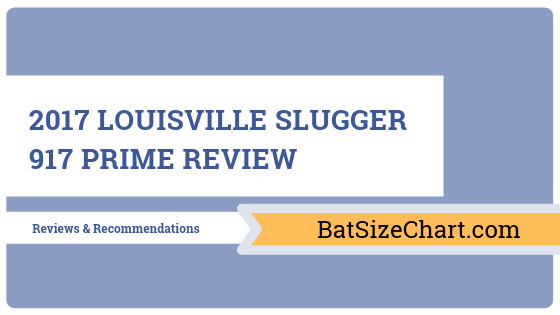 Improved sweet spot: in comparison to the 2016 edition of the Louisville Slugger Prime BBCOR bat, this one delivers noticeable improvements in terms of sweet spot size. The new composite material used is the one that contributes to the increase in sweet spot length. In addition, the bat features a better connective piece than the 916 Prime and is more capable of reducing vibrations. A bit expensive: just like other composite bats, this one is on the expensive side. Thus, the piece of equipment is mostly suitable for use by older players who are already showing some promise in terms of a baseball career. Grip tightening required: several reviewers report that after several uses, the grip is starting to come off. The issue can be fixed through manual tightening but this can be an annoying issue for serious hitters. Some issues with handle durability: only a few players report experiencing handle breakage problems (both with the 916 and the 917 editions of the bat). The experience isn’t a widespread one and it could potentially refer to a faulty item or a misuse of the bat. Similar to the 2016 916 Prime: apart from the sweet spot enhancement, the new bat has lots of similarities with the previous edition. People who are looking for ways to get quality and enjoy a reduced price may want to opt for the 2016 Prime BBCOR bat. There are many reasons why Louisville Slugger bats are so popular. The company sticks to traditions but isn’t afraid to experiment with functional innovations either. This balance is the one that has drawn so many people to the Prime range of BBCOR bats. With a massive sweet spot enhancement, the 917 Prime bat is definitely worth a try. Keep in mind, however, that this bat is more expensive than other high quality items that the market features. The 917 Prime is mostly suitable for use by older players who have a well-developed technique and a potential for growth in the world of baseball. Hybrid construction two-piece bats are gaining more and more prominence because of the performance enhancements that these bring to the table. Unfortunately, such pieces of equipment can be quite costly. If you are looking for a reasonably priced and well-made hybrid BBCOR bat, you should consider Easton Z-Core Hybrid. The 2017 edition of the bat brags a couple of great innovations that boost the appeal of the product even further (click here to see Best BBCOR Bats of 2017). The 2017 Easton Z-Core Hybrid features a barrel made of Easton’s exclusive hyperlite matrix (HMX). The alloy is both lightweight and very durable. The internal Z-Core technology increases the sweet spot and reduces the weight of the bat even further. According to the official presentation by the manufacturer, this is the bat featuring the longest aluminum BBCOR barrel in the world of college baseball. The combination of HMX and Z-Core produces a huge hitting surface that will obviously enhance the performance of the player and increase ping. Since this is a hybrid item, the handle is made of SIC black carbon composite. Lightweight and easy to grip, the material will give every single player more confidence and power. In addition, the material is recognized for its ability to reduce vibrations significantly. The construction: the combination of Easton’s HMX barrel and the black carbon handle produces a high quality, durable and lightweight BBCOR bat. Both of the materials used have been chosen cleverly to maximize performance. Impressive barrel size: obviously, the barrel size is an important characteristic for serious high school players. 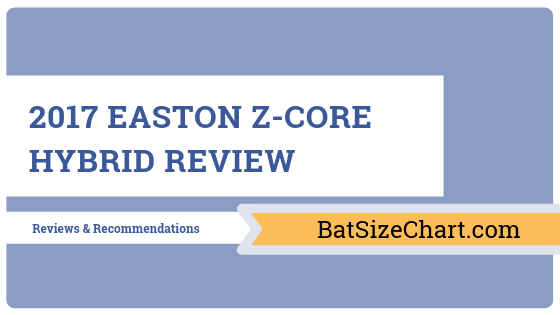 Easton Z-Core Hybrid delivers a massive barrel in comparison to other BBCOR bats. Reasonable price: hybrid and two-piece bats are usually some of the costliest pieces of equipment on the market. The Z-Core Hybrid comes with an excellent price to quality ratio. End-loaded feel: for some players, the end-loaded feel of the bat is a massive advantage. Z-Core Hybrid is also characterized by an excellent pop. Weight of swing: the market does feature a couple of light swing hybrid bats that offer a better performance than the Easton Z-Core Hybrid (these items, however, may come with a higher price tag). Very similar to the 2016 edition: Easton hasn’t made that many changes from the 2016 edition of its hybrid bat. If you are looking for a more affordable option, you can go for the 2016 model and you will not regret the decision. There aren’t that many reviews about the product yet and it’s difficult to find additional information based on actual experiences. The good news is that the shortcomings don’t really interfere with the performance of the bat. The bad news is that the 2017 hybrid by Easton doesn’t offer that many improvements on top of what the 2016 bat featured. The combination of an aluminum barrel and a composite handle brings together the best of both worlds. This is the main reason why hybrid bats have been gaining prominence over the past few years. The 2017 Easton Z-Core Hybrid is an excellent example of why such equipment is continuously gaining fans among baseball players. While it is a bit more expensive than other high quality Easton bats, this hybrid item does bring a lot to the table. There aren’t too many shortcomings and if you feel comfortable with the product’s price range and dimensions, you should definitely give it a try. Anyone interested in a high quality, mid-price range aluminum alloy bat will be impressed with the 2017 Marucci CAT and everything that it has to offer. The piece is a truly balanced one and it’s characterized by a light swing weight (click here to see Best BBCOR Bats of 2017). In a world where oversized bats with huge barrels are becoming the norm, CAT & by Marucci offers a nice alternative. The following comprehensive review will help you figure out whether the bat is the right one for your needs (check out top BBCOR Bats here). This is a one-piece aluminum bat that’s a bit more expensive than other alloy models but that still is characterized by an excellent price to quality ratio. In many ways, the bat is similar to its predecessors –CAT 5 and CAT 6. Still, a couple of innovations enhance the experience and make CAT 7 a better pick. One of the most important differences is the improved alloy used. This unique Marucci material is called AZ4X and it increases durability without adding to the weight of the bat. In addition, the barrel design has been modernized to increase the size of the sweet spot two times. Ideal for hitters who like a light swing: the alloy and the design of the bat ensure a light and balanced swing. This is interesting because few stiff power one-piece alloy bats are capable of providing this benefit. Large sweet spot: the new design does optimize the sweet spot massively in comparison to the Marucci CAT 5 and 6. Loud pop: the material that the barrel is made of guarantees a pop that doesn’t compare to any other. This is one of the characteristics that most of the buyers were particularly impressed with. Excellent vibration reduction: the technologies used to deal with negative vibrations are effective enough to help players overcome the issue and forget about it. Even when players did get jammed, they didn’t experience the typical vibration issues for such a situation. Well-made: the bat is beautiful and it feels solid because of the quality of materials used. If you’re interested in a piece that will remain in an excellent condition for a long period of time, you’ll be happy with this one. A bit heavier than CAT 6: if you’ve previously used Marucci’s CAT 6 BBCOR bat, you may feel that CAT 7 is a bit heavier. The bat is still well-balanced and most players get used to the difference relatively fast. Slippery grip: during the first few uses of the bat, the brand new grip may feel a little bit slippery. After a few sessions, the issue gets resolved on its own. Players that have sweaty hands may consider using batting gloves. Some people don’t like the loud pop: while some players live for the loud pop that their bats make, others feel distracted by the sound. As already mentioned, Marucci CAT 7 has unsurpassed pop. For some players, this characteristic can be seen as a disadvantage. 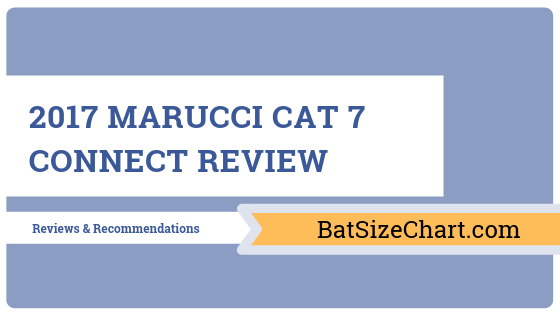 The 2017 Marucci CAT 7 BBCOR bat is a wonderful piece of equipment because of the excellent price to quality ratio. The company has also managed to build upon the positive aspects of its CAT 6 and introduce several great innovations. If you like one-piece aluminum bats that are perfectly balanced, characterized by a light swing and a loud pop, you will be happy with what the CAT 7 has to offer. This isn’t a specialized bat but rather a crowd pleaser. As a result, you may end up having teammates wanting to use yours all of the time. This is as far as shortcomings go with the piece. While the Rawlings 5150 isn’t the most popular Rawlings BBCOR bat out there (check out top BBCOR Bats here), it does have its fans. This is the main reason why the 2017 edition of Rawlings 5150 builds upon what hitters have come to love and expect from the company (click here to see Best BBCOR Bats of 2017). With a very reasonable price tag and a couple of great characteristics, this bat is a piece of baseball equipment worth exploring. Made of aerospace grade alloy (5150), this bat is lightweight and long-lived. It will appeal to anyone in need of durability. The one-piece alloy construction increases the lifespan of the item even further. On top of that, the specific material results in a highly recognizable ping that Rawlings 5150 fans love. The bat also features the precision optimized performance or POP 2.0 technology by Rawlings. The technology is needed to isolate the weight to a small region of the bat for a better balance. This innovative design technology will also maximize the sweet spot of the bat. An excellent price to quality ratio: this bat is crafted out of aerospace-grade aluminum. It is more than reasonably priced and it will remain in an excellent condition for many years to come. As a result, this bat is great for both beginners and more advanced players. Excellent pop: due to the material used in the item’s construction. The 2017 Rawlings 5150 is recognized for the highly distinctive pop. Large sweet spot: the POP 2.0 technology that Rawlings is so proud of does lead to major improvements. It expands the sweet spot for better control over the bat and enhanced performance on the field. Balanced: the bat feels really lightweight and it isn’t top-heavy. This is the most versatile design and yet another reason why Rawlings 5150 will appeal to a vast range of hitters. Stiff barrel: since this is a lightweight bat, it may contribute to some loss of power. The brand new 5150 compensates for this fact through the stiffness of the barrel. Because of this design specific, the power of performance is guaranteed. Thin and functional grip: this is another characteristic that enhances the functionality of the BBCOR bat and keeps the hitter in charge throughout the game. Similar to 2016 Rawlings 5150: there aren’t huge differences between the brand new bat and the 2016 edition. Players who have been expecting more pronounced innovations may feel disappointed.• Loudness: while some enjoy the specific loudness stemming from the use of this particular alloy, other batters may feel annoyed by it. Rawlings fans prefer the VELO range: in comparison to 5150 BBCOR bats, the Velo range comes with a better balance and a larger sweet spot. This is the main reason why the fans of the brand opt for the Velo range. The 2017 Rawlings 5150 BBCOR bat is reasonably prices and great for both beginners and more advanced players. Well-balanced and made of durable aluminum, this is a bat that will last a very long time. Once again, this isn’t the world’s most favorite Rawlings piece of equipment. Still, the bat has numerous fans because of the POP 2.0 technology and the exceptionally durable aluminum alloy. 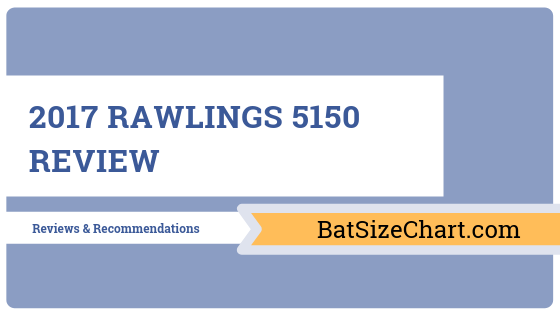 If you are looking for a well-made, one-piece aluminum bat, you will like the Rawlings 5150. The design does require some getting used to and the bat may feel a bit on the lighter side. Still, if you get used to these characteristics, you’ll probably enjoy the bat a lot and see improvements in your batting performance. Any serious baseball player knows the name DeMarini’s Voodoo. The DeMarini’s “Voodoo” baseball bat line is considered to be one of the best equipment available on the market. The 2017 DeMarini Voodoo Balanced baseball bat line is for the serious athlete that has a lot of potential (click here to see Best BBCOR Bats of 2017). The “Voodoo” bat line has been a top runner in the two-piece hybrid bat game; from professional athletes to semi-pro players to the above average league player. Even though most individuals who play ball know this line’s name, the line is not made for your average everyday league player in mind. DeMarini Voodoo baseball bats are created for the strongest players on the team (check out top BBCOR Bats here). Where to buy the 2017 Voodoo Balanced? Since this bat is now no longer price protected by manufacturers, the best price is usually found on eBay. I found a few real cheap options new in wrapper and a couple used ones that you could get for just about shipping prices. The baseball player who wants or requires dynamic, out of the box performance. The baseball player who doesn’t want to worry about how durable the type of bat is and doesn’t want a composite bat barrel sound when hitting the ball. The baseball player who is quite comfortable utilizing a high performance bat. The baseball player who would rather have a bat that has a soft smash of a high quality two-piece baseball bat. The baseball player who requires a swing that is lighter; not the lightest baseball bat. As I mentioned above, the 2017 DeMarini Voodoo Balance is made for the strongest players around, therefore, just because this line of bats is top of the line, doesn’t necessarily mean it is meant for every player. Even the player that can afford this line of bats but isn’t the strongest player should find something that will fit their needs much better. DeMarini manufactures quite a few other baseball bats that would probably be a better fit in the long run and help you to make the most of your game. The baseball player who prefers an ultra-light swing bat. The baseball player who wants the sleeker feel and hollow crack of the composite baseball bat barrel. Prefers or requires an end-loaded baseball bat. 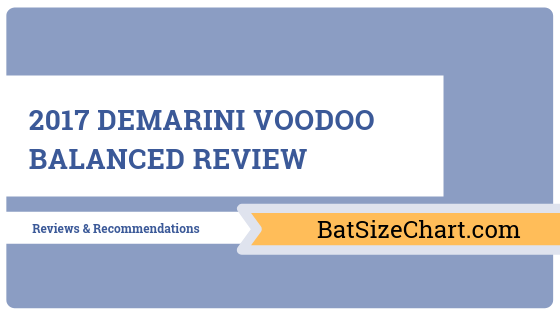 The baseball player who loves to play but can’t stretch their budget enough to pay high-end prices such as is the case for the DeMarnini Voodoo Balance bat. The baseball player who prefers an extremely long barrel. The 2017 DeMarini Voodoo Balanced bat comes in six differing sizes. Please keep in mind that the Voodoo Balanced is different from the Voodoo End-load. Each size of the Voodoo Balanced is coded with a separate color to assist in knowing the size by looking at it. The 2017 BBCOR Voodoo Balanced: This size bat comes color coded with a red stripe and a red grip. Be careful when shopping for this bat as the colors are quite close to the colors on the Voodoo End-loaded. The 2017 Drop 5 – 2 5/8 Barrel, Voodoo Balanced: This size bat comes color coded with accents of green surrounding it. PLEASE NOTE: The design and colorization closely resembles the 2017 Drop 9 5/8 which also has accents of green surrounding the bat but is lime green. The 2017 Drop 9 – 2 5/8 Barrel, Voodoo Balanced: This size bat comes color coded with lime green. As stated above, PLEASE NOTE, the design and color coding resembles very closely to that of the 2017 Drop 5 – 2 5/8. The 2017 Voodoo Balanced: This bat is also been added to the new “Voodoo” line and is expected to be the most popular baseball bat out of all large barrel bats. The “Voodoo Balanced” is available in a drop 10 – 2 ¾ only for the moment. The 2017 Voodoo Balanced – Junior: This size bat is set to be released. There are some differences from this bat and the others listed. The main difference is this is a one-piece bat and not a two-piece. The reason it is placed in the same category is that the same alloy amount is used inside the barrel and goes clear down through the handle too. 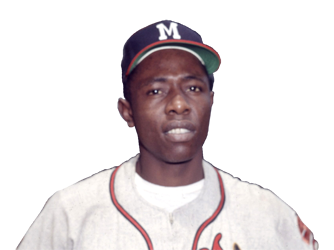 The “Voodoo Balanced Junior” is rated to withstand pitching speeds of around forty-five miles per hour, however, many believe it would survive higher speeds, but I do not recommend trying that. This is a shorter bat and is available in 25”, 26”, and 27” only. The 2017 Drop 13 – 2 ¼ – Balanced- Youth: This is the last bat available in the “Voodoo Balanced” baseball bat line. It has a barrel for a youth and you will find that the color coding on this bat is a wonderful stand-out, burned orange shade. I know that most likely the parent in the house will be running out to purchase the baseball bat that is required and begged for. This includes, people like me, who don’t know anything about baseball. This is one reason that the color coding helps a lot. Just make sure that you are careful and not pick up the similar color coded bats that are available on the market. I had a chance to hit with and heft the Easton Lock and Load bat. I thought the bat felt good and, frankly, just like the Z-Core Easton bats. Which, it turns out, it is supposed to feel like. I thought the locking mechanism for the end cap was a bit cumbersome although unique and ultimately useful. It did change the swing weight, obviously. But any review saying they could change the end cap weight in the dugout does not know what they are talking about. It is way too cumbersome and involved to be changing that thing around mid game. You may use the weight changing mechanism on the bat, but if your intent is to change your bat’s weight on the fly then I think you’ll be disappointed. 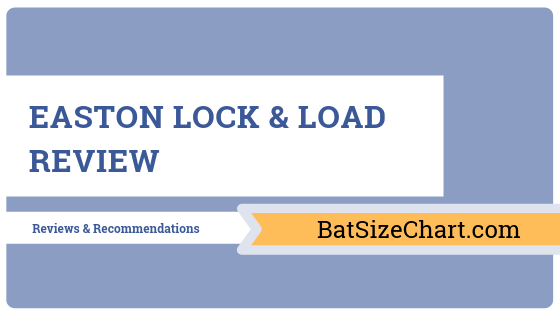 Where to Buy the Easton Lock & Load? I always check out eBay pricing before I go anywhere else. There are also a few facebook groups that sell new and used equipment. Many of these are under the table deals so be careful in terms of a warranty and a real receipt. But, I always look there first to see how much I could save. I would give the Lock & Load a 4.33 out of 5 stars. I love the innovation of the new bat. And the performance is proven from bat’s Z-Core history. But, it loses marks as the bat weight system is more cumbersome than I would hope. And, although I understand the price increase, think the price of this single piece aluminum might give people pause. If you need a single piece aluminum bat then the Z-Core lock and load might be a very good fit. However, do note that it is more expensive than other single piece aluminum bats. But, in theory at least, the bat can serve the purpose of three bats with it’s three different weight options. The other option, if you know the exact swing weight you like, would be to buy an Easton Z-Core bat. 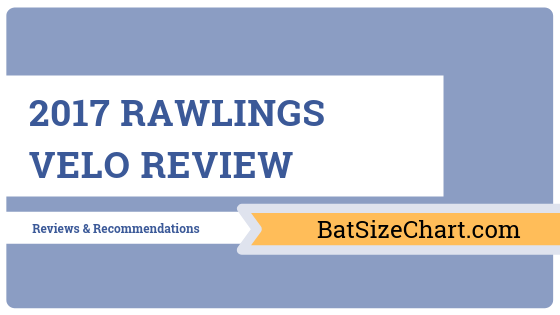 We review those bats here. However, while the bat can be used in NCAA play, it cannot be used in NCAA with the weights. It has to stay at the “speed” option (no weight) to be used there. In Highschool you can use the different weights. As the bat is new, there are not very many places that have actually seen and used the Z-Core Lock and Load. Most are generally positive. But, the idea of a premium for a feature you may never use is questionable. Yet, the idea is cool enough that hopefully man will take it for a swing. The Rawlings Velo is probably one of the most loved and versatile bats by Rawlings. Recently, the company launched the 2017 edition of its highly successful bat. Several characteristics make the 2017 Velo better than its predecessors. Let’s find out what this BBCOR-certified bat has to offer (click here to see Best BBCOR Bats of 2017) . Velo is a one-piece alloy construction BBCOR bat. Although more expensive than other one-piece aluminum bats, this one is characterized by an excellent price to quality ratio. Over the years, Velo has gained a reputation of being one of the lightest and fastest BBCOR bats out there. The 2017 edition doesn’t disappoint and these paramount characteristics are maintained. Apart from featuring one of the loudest alloys out there for an excellent ping, the bat also comes with Rawlings POP 2.0 technology. This technology improves the balance of the bat and maximizes the sweet spot. In addition, the bat features a Silver Comp Lite composite end cap. The cap that is fiber reinforced will improve the balance of the bat even further by removing the unnecessary weight from the end portion of the barrel. Where to buy the Rawlings VELO? I looked at several places for the best price on the Rawlings VELO. We found that for older models that eBay was the best place to look. Extremely well balanced: of all the BBCOR bats out there, this one ranks among the lightest and best balanced items. The bat is comfortable to grip and it will send the ball a long distance away. Great sound: the acoustic alloy that the company used is doing an excellent job in terms of making the bat distinctively loud. Apart from producing a great sound, the aluminum is also incredibly durable and long-lived. POP 2.0 technology: in essence, the technology refers to internal grooves within the barrel of the bat. The grooves don’t have an impact on the durability of the bat but they increase the lightness and also have a positive effect on the size of the sweet spot. Composite end cap: the composite end cap is another very smart feature. It contributes to the even and effective distribution of the weight, enhancing the balance of the BBCOR bat even further. No other single piece aluminum bat comes with the same clever design feature. Great grip: the design of the handle and the material that it is covered with both contribute to an excellent grip throughout the game. A wonderful price to quality ratio: while this one-piece aluminum BBCOR bat is a bit more expensive than its counterparts, the durability and the design innovations justify the expenditure. Loudness: while some people do enjoy the loudness of the acoustic alloy, others seem to be irritated by it. Not suitable for players interested in a top heavy bat: while balanced bats are incredibly versatile, some players will simply be in need of a more specialized solution. This item isn’t the right one for them. 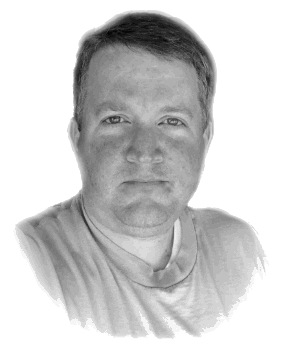 Getting used to the lightness will require a bit of time: players that have previously used a heavier bat (and let’s face it – most BBCOR aluminum bats are heavier than Rawlings Velo) will need some time to adjust. A few games will be required to get used to the feel of this piece. There is a reason why Rawlings Velo is such a popular BBCOR bat. It is lightweight, it is well-made and it comes with an excellent price to quality ratio. The bat corresponds to the needs of a wide array of players and it is very versatile. The shortcomings mentioned in this review don’t really interfere with the performance of the bat or the experience of the hitter. Thus, if you want the best that the one-piece alloy market has to offer, you should definitely give this option a try.